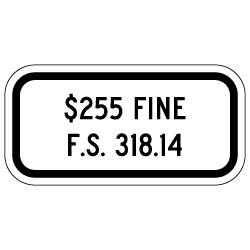 Display this $255 Fine F. S. 318.14 Sign below the FTP-20-04 or FTP-21-04 signs to secure each handicap parking space. Also available in $100 and $160 Fine amounts. Check with your local authorities. DOUBLE the working life of your Florida State FTP-22-04 $255 Fine F.S. 318.14 Signs by adding 3M Protective Overlay Film (POF)! 3M’s high-tech POF protects sign faces against fading caused by the sun and harsh weather—and makes graffiti and sticker defacement damage easy to clear away without harsh abrasives.